The Africa Network for Environment and Economic Justice, ANEEJ, launches Report on the Implementation of 2016 London Anti-Corruption Summit and GFAR Commitments in Nigeria on February 12, 2019 at Denis Hotel, Abuja. The event had in attendance: representatives from Vice President Office, Ministry of Justice, OGP Secretariat, NEITI, CSOs/Media representatives and World Bank. The Report which is one out of many products put in the market by ANEEJ was launched by Dr. Orji Ogbonna, Director of Communications, Nigeria Extractive Industry Transparency Initiative, NEITI and supported by the Department for International Development, DFID. L-R: ANEEJ Executive Director, Rev. David Ugolor; Mr. Edet Ojo, ED, Media Rights Agenda; Dr. Orji Ogbonna, Director of Communications, NEITI and Mrs Ladidi Mohammed, Head, Asset Recovery and Management Unit (ARMU), FMoJ. 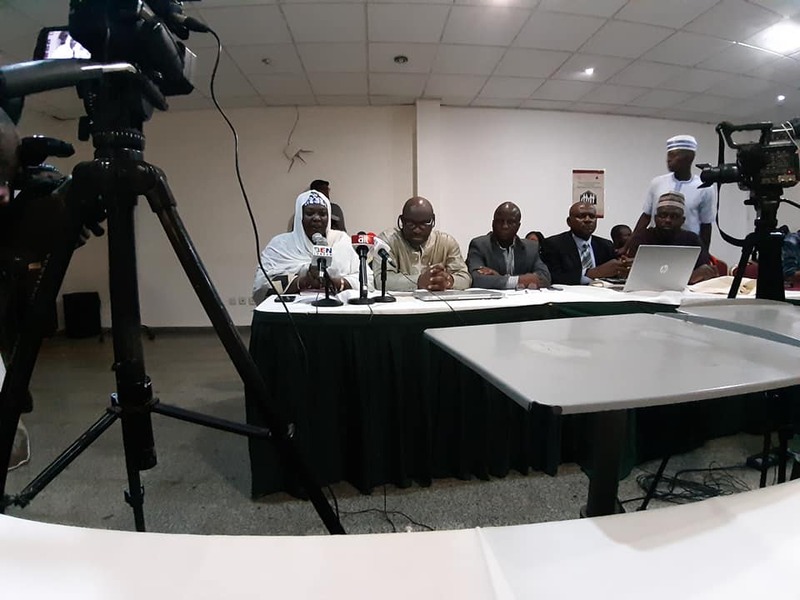 ANEEJ Executive Director’s speech at the Launching: It gives me great pleasure to welcome you all to this very important occasion of the launch of ANEEJ’s report on the implementation of 2019 London Anti-corruption Summit and GFAR Commitments in Nigeria. ANEEJ Executive Director, the Rev. David Ugolor gives his welcome address during the Launching of the GFAR Report in Abuja. Local and international observers have severally referred to Nigeria as a “sleeping giant”. This metaphorical reference succinctly alludes to the vast potential of an otherwise great nation enriched by both human and natural resources, yet with millions of her citizens impoverished by endemic corruption. Well-wishers of Nigeria across the civilised world have pondered endlessly, trying to find appropriate answers to the Nigerian conundrum of abject poverty in the midst of obvious natural endowment. Perhaps this concern revolves around an un-answered question of whether the world can sleep peacefully with the two eyes closed when poverty, engendered by pervasive corruption, traverse the land of the most populous black nation in the world. One can safely state that the 2016 London Anti-corruption Summit and the follow-up Global Forum on Asset Recovery (GFAR) of 2017 held in the United States of America were parts of the efforts to end an undesirable practice in order to bring succour to victims of corruption and enhance development in affected countries. Having attended the 2016 London Summit and played a significant role by leading over ten Civil Society Organisations to the GFAR in USA and presented CSO’s position on the challenges posed by corruption along with possible ways to move forward, ANEEJ has relentlessly implemented various project that will remove the cankerworm called corruption in both public and private sector. Since that historic summit in London and Nigeria’s signing on to the Open Government Partnership (OGP), ANEEJ has collaborated with government agencies and other civil society partners to take the OGP to sub-national level. I am delighted to say that our efforts have not been in vain as one state after the other sign on to the OGP. It is a thing of joy that from the initial single membership of Kaduna State, 13 other states like Niger, Anambra, Enugu, Ebonyi, Abia and the commendable most recent efforts of Edo State Government among others are fully in the OGP while others are in the process of on-going engagements with state and non-state actors. Mrs. Ladidi Mohammed, Head, Asset Recovery and Management Unit (ARMU), FMoJ gives her goodwill message to congratulate ANEEJ. In the same vein, ANEEJ has been monitoring the disbursement of $322.5million Late General Sani Abacha Loot that was returned by the government of Switzerland through a project called Monitoring of Recovered Assets in Nigeria through Transparency and Accountability (MANTRA) with the support of UKAID. Working with CSO partners in all the six geopolitical zones of Nigeria, ANEEJ has successfully deployed over five hundred monitors and supervisors across the states where the loot was being returned to the poorest of the poor through the National Cash Transfer Office in the Conditional Cash Transfer programme of the Federal Government of Nigeria in line with the MOU signed by the Nigerian Government. ANEEJ Director of Research and Policy, Dr. Mathew Ayibakuro gives a brief summary of the GFAR Report just before it was unveiled. This report that is about to be launched today is our dispassionate documentation of the implementation of the 2016 Anti-corruption Summit and GFAR Commitments. ANEEJ’s expectation is that the fight against corruption should be a concerted one that requires the participation of all and sundry. It is our hope that if all hands are on deck, freedom from the stranglehold of corruption and its attendant consequence of pervasive poverty in our country will be a thing of the past. Mr. Benjamin Ogu Okolo, NAtional Cordinator, OGP, gives an opening statement during the launching of GFAR REport. We also want to specially acknowledge input of the Ministry of Justice/Open Government Partnership Secretariat and the Nigerian Extractive Industry Transparency Initiative(NEITI), both government agency/institutions validated the report by reviewing some of the key recommendations. Is our hope that in the spirit of Co-Creation of the OGP and Global Forum on Asset Recovery (GFAR) Principles civil society will continue to collaborate with government to sustain the effective civic engagement that will improve governance in the Country. On behalf of ANEEJ’s Board of Directors, management and staff, I wish to express my appreciation to our development partner, United Kingdom Agency for International Development/DFID for the support given to us to carry out several activities under the MANTRA project. I also want to thank you all for gracing this occasion. By your presence, awareness and commitments to enhance a corruption-free Nigeria, you have brought a positive meaning and hope to the anti-corruption crusade.